A hand-coloured print of Esplanade Row, Calcutta, from the Fiebig Collection: Views of Calcutta and Surrounding Districts, taken by Frederick Fiebig in 1851. 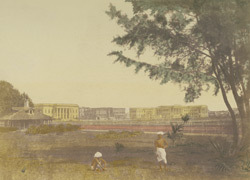 The Esplanade was made by clearing away the jungle around Gobindpore, the most southerly settlement of Calcutta, to build New Fort William in 1757. Esplanade Row was the street marking the southernmost part of the city, and was itself the northern limit of the Esplanade. It was home to many impressive public building including the Town Hall and Government House, the palatial residence of Governor-Generals, commissioned by Marquess Wellesley in 1798.